On April 23, 1945, Second Lieutenant Ichirō Ōno took off from Chiran Air Base and died in a special (suicide) attack west of Okinawa at the age of 22. He was a member of the 103rd Shinbu Special Attack Squadron. He piloted a Type 99 Assault Plane (Allied code name of Sonia). After his death in a special attack, he received a promotion to Captain. He was from Gifu Prefecture, attended Yokohama Higher Technical School, and was a member of the 1st Class of the Army Special Cadet Officer Pilot Training (Tokubetsu Sōjū Minarai Shikan) Program. Recently my desire was fulfilled, and I became a member of the Special Attack Corps. I will make a sortie to a certain area. In my student days I devoted myself to studies in addition to aircraft piloting. Please understand well that today this is to my advantage. I will fight with complete devotion to fulfill my important mission to defend the Empire and also for the honor of the Ōno Family. My request is that I want you to place all your hopes on me. Father and Mother, I earnestly pray that, in addition to taking care of yourselves, that you have much success. The following final letter is addressed to Kanesuke Kinoshita, who must be his older brother based on references in the letter. His last name of Kinoshita probably was taken from his wife's family name. I have neglected to write for a long time. Suddenly I am writing a short note. I trust that your family is enjoying good health during this season when cherry blossoms are in full bloom. Recently it came about that I will make a sortie to a certain area as a Special Attack Corps member. I have supreme joy to have obtained the opportunity to follow Older Brother Hiro's wishes and to live nobly for an eternal cause. Please report my regards to Older Brother Hiro's spirit. Also, I thank you again and again for your care during my lifetime. Finally, I pray for your family's prosperity. Please put your hopes in me. Postscript - As for the information in this letter, I request that you do not disclose anything until the official announcement after my death in battle. The letters come from Chiran Kōjo Nadeshiko Kai (1996, 105-6). 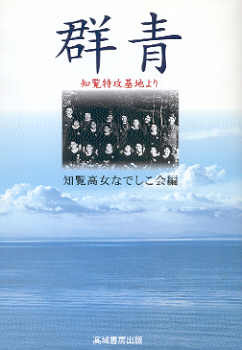 The biographical information in the first paragraph comes from Chiran Kōjo Nadeshiko Kai (1996, 105), Chiran Tokkō Irei Kenshō Kai (2005, 184), and Osuo (2005, 203). 1. Gōma means "conquering the devil." The 2nd Gōma Squadron also was named the 103rd Shinbu Squadron. Chiran Kōjo Nadeshiko Kai (Chiran Girls' High School Nadeshiko Association), ed. 1996. Gunjō: Chiran tokkō kichi yori (Deep blue: From Chiran special attack air base). Originally published in 1979. Kagoshima City: Takishobō.